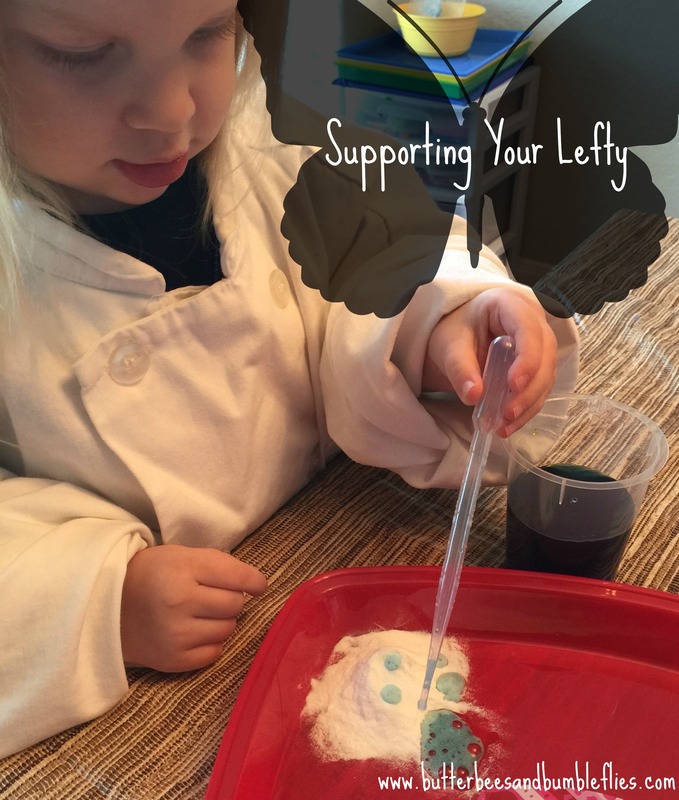 A conversation recently came up over on my Facebook page about how to support a left-handed child – especially when that child might be the only one in the family who is a lefty. It can be a challenge. MOST “touchy-feely” books only have the feeling spots on the right side. Desks for school children are made to support a right arm. Most spiral notebooks are bound on the left side. Scissors are often hand specific. But take heart!!! Mirrors are a fabulous thing. It’s also great to sit across from your child to model something for them – so they are looking at your mirror image. And, I have noticed that Becca tends to use her right hand for some things simply because that’s what she’s seen me do over and over, and it’s easier to mimic. Cody says that he uses his right hand a lot for things, too – including his computer mouse at work – simply because that’s the way the world works. I think left-handed folks end up having to be more ambidextrous than those of us who are right-hand reliant. I can do a lot with my left hand, but I don’t hardly ever lead anything with my left hand. Becca can use both hands fairly well. “Eric Chudler, University of Washington, has a Web site called “Neuroscience for Kids.” It includes games, quizzes, and links to brain development and function. The following activities are adapted from his work. Each activity offers school-agers opportunities for charting and graphing, surveying, and evaluating evidence. Have plenty of chart paper and markers on hand. Encourage children to make notes of their observations. If your classroom has Internet access, children can upload their data and exploration results. Rather than ask children which hand they use, set up observation experiments that rely on more than self-reporting. Prepare observation charts with three columns: Left Hand, Right Hand, Either Hand. Have observers chart peers in tasks such as using a fork, painting at an easel, turning a door knob, and throwing a ball. Left foot or right foot? Set up the same observation system as in the previous activity. Have observers chart their peers in tasks such as kicking a ball, walking up stairs (Which foot steps first? ), time spent balanced on each foot, and stepping on a picture of a cockroach. Check for eyedness. Chart these tasks: looking through a paper tube, looking through a magnifying glass, and winking (Which eye winks more easily?). You can chart eye dominance too. Cut a coin-sized hole in a sheet of construction paper. Ask the subject to hold the paper and look through the hole at a distant object using both eyes. Ask the subject to bring the paper closer and closer to the face while still looking at the object. As the paper comes close to the face, only one eye will be looking through the hole. Which one? Left eat or right ear? Plus check out this book – I think I’m gonna have to get it!